Chloes Look Of Love So Truly Real Touch-Activated Lifelike Baby Doll by The Ashton-Drake Galleries. This is a brand new: Chloes Look Of Love So Truly Real Touch-Activated Lifelike Baby Doll by The Ashton-Drake Galleries Few things are as precious as the first time your baby responds to your touch by turning her little head towards you, blessing you with a look of complete trust. 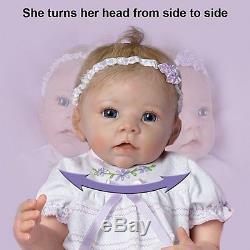 Now this remarkable So Truly Real touch-activated lifelike baby doll perfectly captures that special moment. Chloe is then handcrafted of baby-soft RealTouch vinyl, with heart-melting hand-painted features and wispy baby hair. She arrives in a darling outfit adorned with ribbon and floral embroidery. She's even fully poseable, making her even more lifelike. Strong demand is expected for this breathtaking touch-activated baby doll, so don't wait to bring her home. A first-ever So Truly Real? Touch-activated baby doll by award-winning doll artist Linda Murray that turns her head from side to side, exclusively from The Ashton-Drake Galleries - Baby Chloe is sculpted by artist Linda Murray and then cast in baby-soft RealTouch? Vinyl, with hand-painted features and delicate wispy hair - She responds to your touch! Chloe's head turns from side to side while she looks up at you with a trusting expression that's amazingly lifelike - Chloe arrives in a darling outfit adorned with ribbon and floral embroidery - This doll is not a toy, she/he is a fine collectible to be enjoyed by adult collectors. Is only relevant for this item: Chloes Look Of Love So Truly Real Touch-Activated Lifelike Baby Doll by The Ashton-Drake Galleries. We usually respond within 24 hours on weekdays. Feel free to browse our store categories to find more interesting products.. The item "Chloes Look Of Love So Truly Real Touch-Activated Lifelike Baby Doll by The" is in sale since Saturday, March 19, 2016. This item is in the category "Dolls & Bears\Dolls\By Brand, Company, Character\Ashton Drake\So Truly Real".sales" and is located in US. This item can be shipped to United States.